The humble 4-koma: a style of manga featuring four panels aligned vertically; otherwise known as yonkoma or four panel manga. Most examples are found acting as a complement to series, an extra bonus awaiting those who acquire the bound volumes. Look no further than Hayate the Combat Butler, Genshiken, or The World God Only Knows for plentiful examples. They are also found in Japanese newspapers and magazines, akin to our own political cartoons. They are short, sweet, and relatively ubiquitous. Yet, some manga use the format for the series itself. Again copious examples may be found, some of which have anime adaptations. Hidamari Sketch, K-On, Lucky Star, and the recently adapted Kill Me Baby, are just a few examples. All are generally light series, never straying too far from a slice of life and mostly including comedic elements. Indeed, the style itself is effectively defined by light, airy comedies. Yet, there are always exceptions to a rule, and it is these exceptions that I find affecting. By a curious turn of events, that I shan’t bother boring you with here, I was introduced to three series, all being of a distinctly artistic persuasion. These, as you can probably guess, are Hidamari Sketch, Sketchbook, and GA Geijutsuka Art Design Class. After watching each series’ adaptations and finding them adorable, boring, and batty, respectively, I found myself hunting for the source for both the first and the last. Having acquired, and read them, they were as one would expect. Yet, hidden in the final chapter of the third volume of GA Geijutsuka Art Design Class, henceforth referred to as GA to preserve sanity, we find the focus turning to a specific character. Miyabi Oomichi, known to her peers as Professor and Masa, is of the silent and mysterious kind. She is treated with respect by her peers, and is notably knowledgeable about her subject, but is not entirely above continuing a joke. 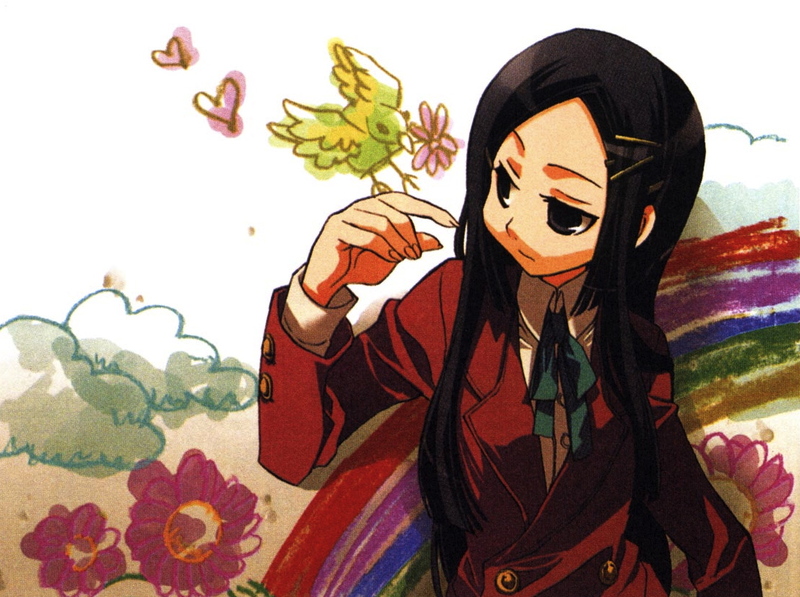 It is also noted early on in the manga that she is engaged, of the arranged marriage kind. The chapter in question shows Oomichi acting slightly off. Through a convenient twist we follow Kisaragi, effectively the main character, on a visit to Oomichi’s home. Here we find the traditional background one would expect of such a character, and an explanation of why she is not her usual self. Some have listed this as dislike for her arranged marriage; yet I find myself disagreeing with this simple reduction. As Kisaragi notes, Oomichi is by no means an unhappy girl. That she would paint such pictures of her fiancé’s shrine, I would argue her not entirely against it. Nervous about the steps she will soon be taking, perhaps, but certainly not an overt expression of dislike. Whilst this scene is not melancholic, per se, it is at the very least affecting. We see beyond the obsidian shell of a character who is either a closed book, or simply one dimensional. It is not too far removed from the whimsicality and overt battiness the series wears with pride, yet, nevertheless strikes a different tone. After reading the series, I did what any other would, and decided to take a look at other 4-koma series. One of these sampled manga was that of Satoko Kiyuduki’s Shoulder-a-Coffin Kuro. Being by the same author as GA, difficult to locate, and with only a few copies remaining on a certain online shop, I decided to take the plunge and bought both volumes. I could very easily wax lyrical on the presentation, style, and extensively coloured illustrations, but that is perhaps for another time. For now, I wish to focus on its plot. Again, we find a relatively whimsical 4-koma, only this time with a fantasy setting. Centred about the eponymous traveller, Kuro, we follow her and her companions through a number of vignettes. Kuro’s tale, however, is much darker than that of GA’s. We find within her pages tales of curses, falsehoods, superstitions, disease, and death. Presented alongside prevalent themes of hope, innocence, and the minutiae of everyday life. Painted with a light brush, the darker elements of Kuro are handled subtly, with neither meaning nor consequence forced upon the reader. The juxtaposition of whimsy and charm, found within 4-koma in general, alongside darker topics, makes for an affecting read. Perhaps an example is in order? Early on in the series we are introduced to the characters Nijuku and Sanju. Both are small children with unusual gifts, such as the ability to shapeshift, and to absorb and give colour to that which is around them. We learn that their father figure, known only as the Professor, has since passed on. 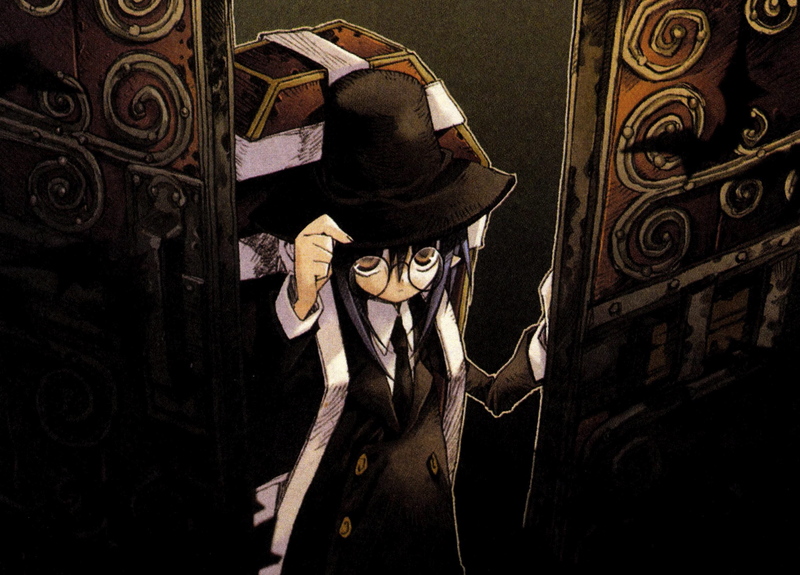 Kuro finds the children locked in a cell in the basement of the Professor’s castle. Explaining the Professor’s demise to the innocent children is both revealing of the two main characters’ personalities, and a delicate moment to observe as the children fail to comprehend that they can no longer see their beloved Professor. Adding to the sense of unease, we find that the Professor holds a reputation for research into the supernatural, that he met his demise in a less than peaceful manner, that his castle holds many cells and dungeons, and that the children’s names mean Twenty-Nine and Thirty respectively. Visions of a stylised Dr. Frankenstein rise unbidden in the mind. Well, in mine at the very least. We go on to see a number of other events. We see that which leads to the death of an entire town. We are told the meaning behind Kuro’s somewhat apt name. We are told bittersweet tales of love, and the final moments of a lonely old man reunited with his wife. Satoko Kiyuduki may not write the most complex, or philosophical, works. Nor does she produce a gamut of popular, action-oriented titles. Yet Miss Kiyuduki has illustrated her ability to inject weight, and perhaps a little melancholy, into a genre that is not known for it. Perhaps she is not alone in doing this, but I would recommend Shoulder-a-Coffin Kuro to both old hands, and to those who have otherwise overlooked the genre for being what it often is. Shoulder-a-Coffin Kuro is one of my favorite manga. It blends utter cuteness and utter darkness in a way like no other, and I love that. I really wish she’d continue the series! Meanwhile I try to eat up more of her art by playing games she did design work for. According to ANN she has already restarted it, and according to Yen Press’ Twitter account they will be releasing them towards the end of the year. Huzzahs all ’round it would seem. I did find her games, but unfortunately there seems to be few means of getting them this side of the pond. Outside of importing, that is, which I would probably do, if I had a spare £80 to fritter away on such things. But anyway, I thank you for your comment. i wodnered if i shoudl start that very series a while ago XD i really should. although it seems to be hard to get.. Digibro, what games did she make the designs for? She’s done two games in the Dept. Heaven trilogy, called Knights in the Nightmare and Yggdra Union, and also an upcoming game called Gungnir.All of them are Norse mythology themed strategy RPGs. sounds interesting, even though i never ehard fo any of those. You might have to hunt for them a little, but if you do stumble across them I would urge you to do so. Yen Press has made a nice job of them. Interesting. I will have to check this out. The most recent 4-koma style manga that I read was Azumanga Daoi and this seems like it would be of a much different variety. From the way you describe Kuro, it draws comparisons in my mind to the difference between Garfield and a series like The Boondocks. To be sure The Boondocks seems like a much more witty series. Yet The Boondocks has a dash of melancholy in it’s humor where a Garfield has none. Anyway I still have to track down Kuro. Interesting post. Thank you, and thank you for reminding me that I have yet to read Azumanga Daioh. I’ve seen the series, but never got around to reading the source for whatever reason. I think that the 4-koma manga format’s capabilities for storytelling has been underrated in general, mostly because of what tends to be popular enough to be animated or sent overseas as the representations of what we see. And I think part of it is that the format doesn’t necessarily scream “STORY” to us given our expectations of how each panel goes. Maybe we just need to tweak those initial expectations in general. I agree. And tweaking the anisphere’s initial expectations would be wonderful. I dare say there are many more out there that are similar to Miss Kiyuduki’s work. It’s just a case of finding them. The structure itself is rigid but not to the extent that you can’t experiment, which is what I would like to see more of, I think. Anyway, I thank you for reading, and for your comment. Okay. 4-koma is one of my favorite genres and that work sounds FANTASTIC. Kind of like Kino no Tabi mixed with March Story? I think what fascinates me mostly is the way in which 4-koma invites incremental development of character and plot. Doujin Work is probably my favorite example of this, as the show mostly hovers around two or three main lines of joke, but the plot does move between strips. Mark Rosewater says (quoted from somewhere) that “restrictions breed creativity”. In 4-koma, that certainly seems to be the case. I must confess that I would not have put you down for liking 4-koma originally. I suppose your Yamada and Yui avatars should have given me some idea at the very least. That Kino no Tabi is brought up again as a similarity is interesting. I shall have to get around to watching it, having been on my ‘to watch’ pile for far too long. Also, Doujin Work, I’ve heard of it but I don’t think I got very far. I’ll take a look at it again at some point. I, myself, feel more drawn to the dissonance between the art and format, and the tone. 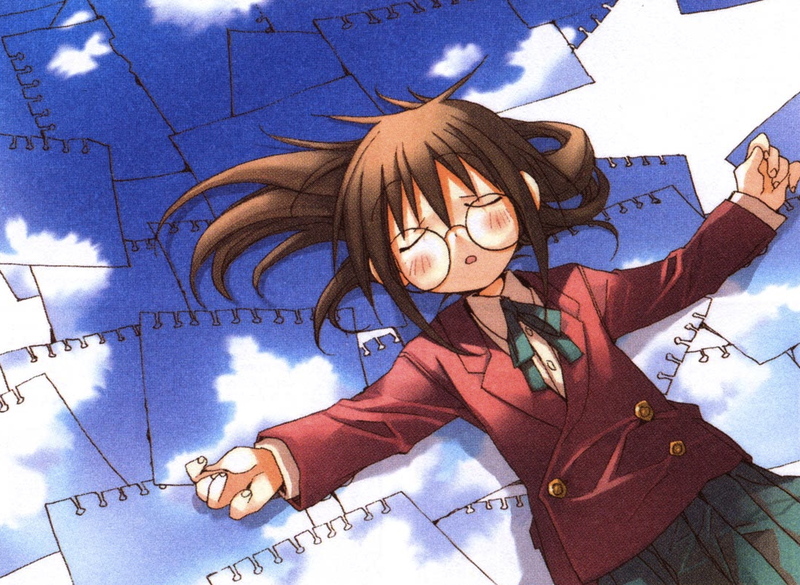 I do see where your interest lies however; Hidamari Sketch is quite wonderful for this. With the reader only really noticing how much the characters, especially Yuno, have changed when he looks at the series again. Kino no Tabi is a massively popular series, and I’d be surprised if you didn’t like it. I’m not a huge fan of the show anymore because I find a lot to hold against it (unlike Kuro, Kino’s art, while simple, isn’t beautiful), but I think it’s worth recommendation because its reputation is overwhelmingly positive. And yes, it’s like this manga, but minus the twins and with darker tones. Sounds intriguing enough. I am not an avid reader of 4-koma, though I have no qualms with it. What I find interesting, and I think the_patches touches on this, is the pace framed between 4-panel sections (between panels 4 and 5). In my opinion, this is dangerous territory because I feel the junction between strips can become repetitive and tiresome. It actually reminds me of the soothing pace of riding a train, you know, tracks come in segments. But ultimately I believe creators can imagine ways to use this style effectively for various themes in progression/continuance. This is partly my reasoning behind writing the above; to highlight that not all 4-koma is the same to those that do not usually entertain it. I’m not the most enthusiastic follower of the format, myself, but it is these little gems with a different cut that I am drawn to. With regards to the 5th panel, and ignoring the Sayonara Zetsubou Sensei jokes: I too find a fair few a tad repetitive at this point, and it is for this reason, I think, why I am not overly keen on Sketchbook. On the style: perhaps its strength does, indeed, lie in comedy; but the ‘strictness’ of the format makes me intrigued to see what can be done with it. As the_patches notes, such restrictions can be beneficial from time to time. Thank you, again, for reading and commenting. It is greatly appreciated. Excellent post, A_Libellule! I’ve never read a 4-koma manga but now I’m intrigued. Particularly kuro sounds awesome. From the franchises you discuss I only know the adaptation of GA which I enjoyed pretty much. I can’t recall if the story about the Professor’s arranged marriage was featured in the anime but it sound lovely indeed. I’d like to mention in this respect my favourite character, Aa-san. The second part of the anime’s episode 5, “The Club President’s little cottage”, imho was also very sweet and… you know, like it would be melancholic if you think too much about it. This episode (at least in my perception) gave Aa-san’s personality a lot of depth as it turned out that she’s not just the genki club president but also an extremely affectionate girl, almost like a child. Is it also featured in the manga? I could be wrong on this of course, but no, I don’t believe GA’s adaptation got that far. It was mentioned in passing at some point however, but with no real emphasis or exploration of the topic. The Club President’s little cottage segment is in the manga, and can be found about two thirds of the way through the second volume. What we don’t see in the series however, which you’ve just reminded me of, is the story of Awara and Mizubuchi (Buchi-san). Approximately a third of the way into the third volume we are told of the story of their meeting, and of their growing friendship. Drawing on the imagery of the cherry blossom trees in the school grounds, and of the sense of mono no aware they evoke, we find another hint of melancholy. Albeit with an amusing twist to the story, which I shan’t spoil here. As a fan of Awara, you might enjoy that little episode. If you enjoyed the series, I would heartily recommend trying the manga. Kuro too, if you like the style and feel of GA’s story. I thank you for reading, and your comment too. ‘Twas much appreciated. Awww, this brings back memories, It seems, A_Libellule, that you like Aa-san, as well, no? In any case I discovered that most of GA and Kuro-san have been published in English and so I just have to wait for the parcel service! I’d like to add a short postscriptum as your post turns out to be even more excellent now that I started reading the manga! The story of the children in Kuro is quite disturbing. One might say the reader is “trolled” by the use of the 4-koma format. The scene about the professor (quite a different kind of professor!) in GA is indeed sweet and also gives the story a lot of additional depth compared to the anime. So thanks again, A_Libellule, for introducing these awesome manga to me! Interesting. I would never have thought the 4-koma style could be used for something like this. Can’t say for sure if the mood of the series is the kind I would be interested in, but since there’s a copy at the library, I may just have to take a look.